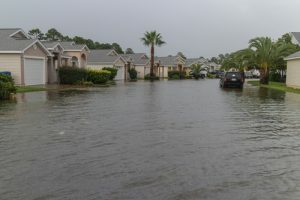 Hurricane Michael was a devastating Category 4 hurricane that hit the Florida panhandle and areas of Southwest Georgia. Thousands of structures were destroyed in its wake including family homes, businesses, offices and schools. The mass destruction left the community at a standstill while they began the daunting process of recovery. The school system in particular took a major hit from Hurricane Michael. The Bay District school system has even begun discussion of closing four of their schools and rezoning the district to account for 5,000 students who have moved away. This has left many employees of the school system out of work and struggling more than ever to recover from the storm. Although they are facing a multitude of challenges, many of the teachers have turned their energy to helping their communities through other avenues. Knowing that many of the children they teach were going without clean clothes, a hot meal or other basic necessities, the teachers worked with the Bay Education Foundation to organize several giveaway events and other forms of assistance for these children and their families. One event included the biggest Christmas giveaway that the community had ever seen. These teachers have focused on helping make the lives of the children they teach easier, all while dealing with their own challenges brought by Hurricane Michael. The Bay Education Foundation believed that these teachers deserved a thank you for everything they did and sacrificed for their community. This is where Good360 and Macy’s stepped in. Macy’s approached Good360 with the desire to make a donation to help support Hurricane Michael survivors. Once they were made aware of the teacher appreciation giveaway, they were eager to help make it a great event. 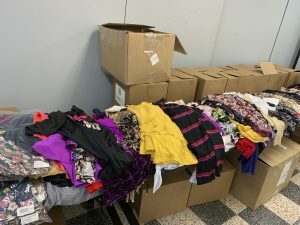 They provided $26,000 worth of brand-new clothing for distribution at the event. They also donated $10,000 in gift cards to allow teachers to buy whatever they needed most. The three-day event serviced nearly 400 members of the education system including teachers, custodians and maintenance staff who were impacted by the disaster. Good360 is thankful to work with Macy’s to leverage their resources to make huge differences in the lives of people facing unexpected and devastating hardship. We thank The Bay Education Foundation and the teachers and staff of the Bay District School System for coming together to help their community recover, both physically and emotionally, from the storm. 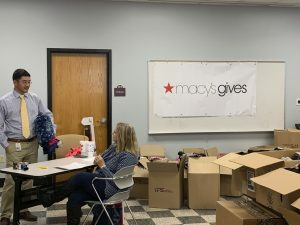 Good360 will continue to work alongside partners like Macy’s who understand the importance of thoughtful giving during a disaster and provide exactly what is needed at the right time in the recovery process.